Though Democrats have for years blamed Republican intransigence for the failure of key campaign finance and ethics reforms in Albany, those measures still appear stalled even as their party controls the entire state Legislature and governor’s office. On Friday, Assembly Speaker Carl Heastie said that the votes are not there in his chamber to approve a public-matching campaign finance system, despite the fact that the Assembly has repeatedly passed such a measure in the past when Republicans controlled the Senate. 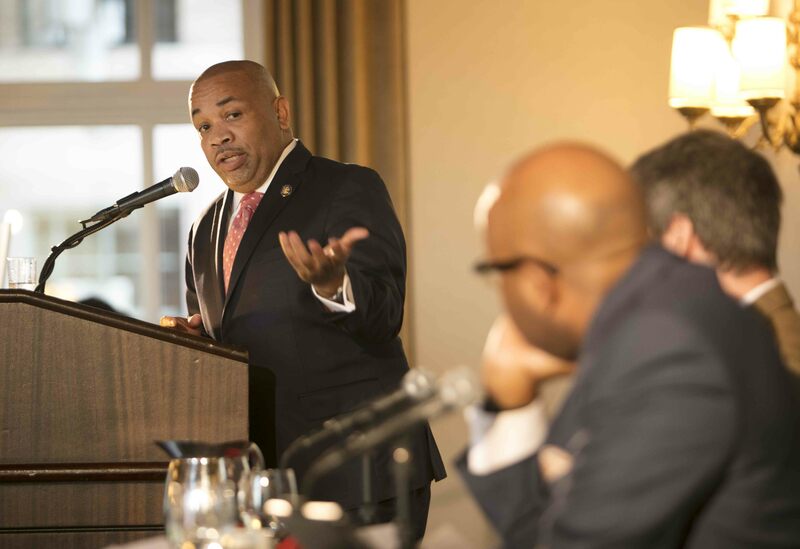 Heastie appeared at a Crain’s New York Business forum at the New York Athletic Club, where he gave remarks about the Assembly’s accomplishments and priorities, then took questions from Erik Engquist of Crain’s and Errol Louis of NY1, before also speaking with other reporters after the event. With a new state budget due April 1, Heastie said it appeared unlikely that the Assembly would approve public campaign financing before or within that deal, though it is a long-held Democratic goal espoused not only by Assembly Democrats but also the new state Senate Democratic majority and Governor Andrew Cuomo. “I think the members want to discuss it but I’d say right now what the concerns are on IEs [independent expenditures], problems with [New York City’s] campaign finance system, also with a shortage of [state] money, I think they want to have the discussion but I’d say right now there’s not 76 members who want to move forward with it in the next three weeks in the budget,” Heastie said in response to a question from Gotham Gazette, and referring to the minimum number of votes needed to advance a bill in the 150-seat chamber. The speaker later tweeted to add to his comments from the morning, writing that the Assembly does want to consider a small-dollar matching program, but one that does not use public money. 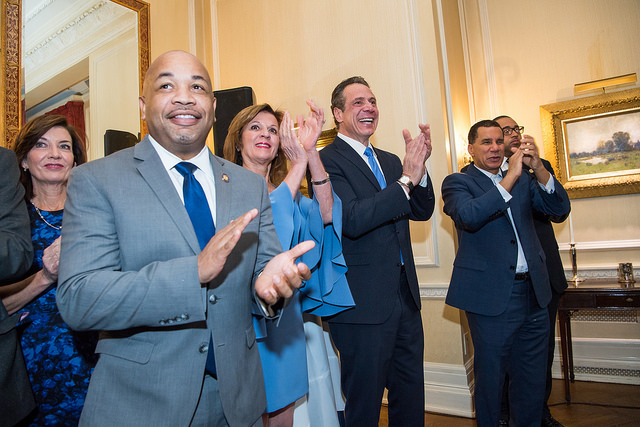 Asked about it by the moderators, Heastie expressed concerns that a bill passed on Tuesday by the state Senate could end up hurting the party in power. The bill, S3167, prohibits companies bidding for state contracts from contributing to “officeholders with authority over procuring entities” within a specific window of time, therefore applying largely to the executive branch, namely the governor. Though Heastie’s conference has advanced similar bills in previous years, he hesitated to endorse that measure, which was sponsored by new state Senator Zellnor Myrie from Brooklyn. The bill would also put the State Democratic Party and Governor Andrew Cuomo, a third-term Democrat, “in a bind,” he said, because it would exclude them from raising funds from entities who would be able to donate to Republicans who don’t hold the same authority in state government. The bill includes a prohibition on contributions “indirectly or directly, to political committees operationally controlled by officeholders with authority over state governmental entities” that receive and review bids and issue contracts. “So I guess that on the surface the bill sounds like a great idea, but it really does put the governor and the Democratic Party at a huge disadvantage as compared to the Republican Party,” he said. Asked about Heastie's comments, Jonathan Timm, a spokesperson for Senator Myrie, said in a statement, "The history of corruption in New York State government demonstrates that inaction is not an option. As with any other legislation, this bill will be subject to negotiation with the Assembly, and the Senator looks forward to working with them to clean up state government in the best way possible." Speaking to reporters after Friday's event, Heastie then tempered expectations about public campaign financing, which appeared for months as though it would be a crowning achievement of the new Democratic era in Albany. His comments weren’t taken lightly by a variety of advocates, including the Fair Elections for New York coalition, which has been pushing the state to adopt a small-donor matching system similar to the one in place in New York City, among other reforms. “Historically, the Assembly Democrats have supported people-powered elections anchored with a small-donor matching system,” the coalition pointed out in a Friday statement, responding to Heastie’s comments as initially reported by Gotham Gazette. 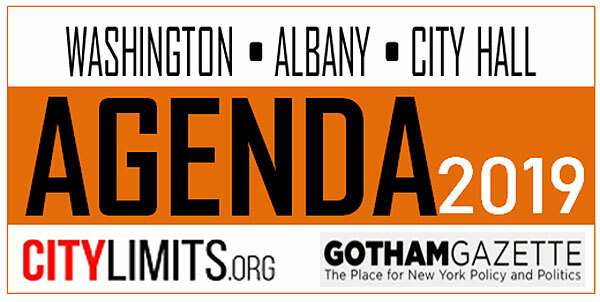 The coalition is made up of more than 200 groups, including labor unions such as 32BJ, tenant organizers such as New York Communities for Change, immigrant advocates like the New York Immigration Coalition, environmental and racial justice groups such as the Sunrise Movement and VOCAL-NY, good government advocates like Reinvent Albany and more. Urging the governor and legislative leaders to reject a budget that does not include public campaign financing, the coalition offered solutions for Heastie’s concerns. It said a public financing system should not include spending limits, therefore mitigating the effect of outside independent expenditure campaigns; suggested that New York follow Connecticut’s public matching program, which gives assistance to candidates in using small dollar contributions, compared to New York City’s program that many have called too punitive; and pointed out that the total budget ramifications of public financing were between $40-60 million, which wouldn’t even be apparent in the short term and could hardly affect a $175 billion state budget. 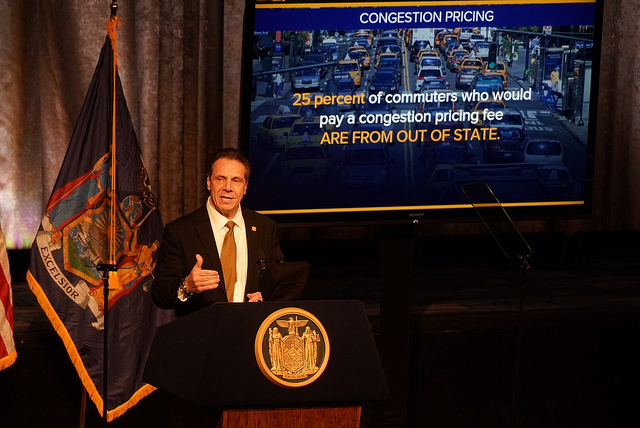 The annual costs, the coalition estimated, would be less than $3 annually for every New Yorker. Asked to comment on Heastie’s statements, neither the office of Senator Majority Leader Andrea Stewart-Cousins nor that of Governor Cuomo responded. After seeing the blowback to his comments, Heastie issued another statement on Twitter Friday afternoon, writing, "I want to be clear – the Assembly Majority is supportive of limiting the influence of money in our elections through consideration of a small dollar donor matching system that does not rely on scarce public funds. Our members are not ready to support the NYC model for the entire state, but we will continue to have discussions in order to reach our goals." Note - This article has been updated with comment from a spokesperson for Senator Zellnor Myrie. Alexandria Ocasio-Cortez’s Democratic primary victory over Rep. Joe Crowley last month in New York’s 14th congressional district sent shockwaves throughout the country and signalled a monumental shift in Queens politics, where the Crowley-led county party has held significant sway in local elections for many years. The effects of Ocasio-Cortez’s win and Crowley’s loss, both nationally and locally, are still developing, but reverberations are certainly being felt in the already-competitive Democratic primary for New York Assembly District 39, where a county-backed incumbent is facing an independent challenger. The district -- part of the 150-seat lower house of the state Legislature, all of which are on the ballot this fall, first in September 13 primaries -- covers the immigrant-heavy neighborhoods of Corona, Elmhurst, and Jackson Heights, and large parts of those fall within Crowley’s congressional district. It is currently represented by Assembly Member Ari Espinal, who was elected in a low-turnout special election barely three months ago, with fewer than 800 votes. Espinal was previously an aide to Francisco Moya, who held the Assembly seat before being elected to the New York City Council last year. Espinal’s challenger in the primary is Catalina Cruz, an attorney with government experience who most recently served as chief of staff to former City Council Member Julissa Ferreras-Copeland. Espinal, whose cousin is Brooklyn City Council Member Rafael Epsinal, ran unopposed for the Assembly seat, having been endorsed by the Queens Democratic Party, which is chaired by Crowley and has played an influential role in not just Queens, but city and state elections for decades, as well as the selection of the powerful City Council speaker and a variety of other appointed positions. For a special election to the state Legislature, there are no party primaries, instead the party county committee selects its candidate for what is a singular public vote. In a heavily Democratic district like most in New York City, the party’s nominee is virtually assured victory in a special election, and therefore gains at least some of the benefits of incumbency ahead of any subsequent intra-party challenges. But the power of the Queens County Democrats’ endorsement is under question following Crowley’s landslide defeat to Ocasio-Cortez as he finishes his tenth term in the House. Queens Democratic insiders say Cruz is in important ways a stronger candidate than Espinal and that the Queens county machine -- a descriptor some take issue with -- is playing a minimal role in the race and has a far less threatening presence in the immediate aftermath of last month’s election. Some also point to the fact that the Queens county party has been defeated in a number of elections over the years by strong insurgent candidates, such as the victories of current City Council Members Daniel Dromm and Jimmy Van Bramer, as well as Ferreras-Copeland’s first win. 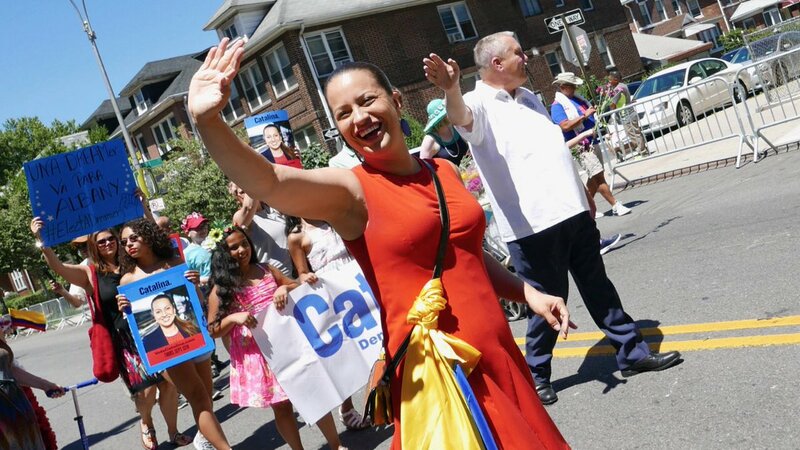 Moya, meanwhile, helped orchestrate Espinal’s ascension and is actively campaigning on her behalf in an area where he has won several recent elections. Having been in office just under three months, Espinal has been prime sponsor on one bill that was passed by both legislative chambers, to extend a labor law relating to unemployment insurance proceedings, and another, called Carlos’ Law, which enacts punishments for developers that put workers at risk of injury or death, which passed only the Assembly. Espinal has also allocated hundreds of thousands of dollars to her community, she said. She signed on to the Dream Act, which aims to provide state financial aid to undocumented immigrants seeking higher education. 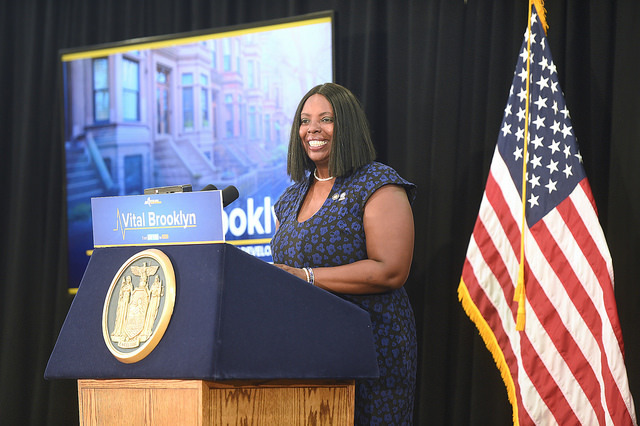 She’s received support for her reelection bid from Moya, City Council Speaker Corey Johnson, Queens Borough President Melinda Katz, Bronx Rep. Jose Serrano, and the Working Families Party. Cruz, Espinal’s opponent, strikes a similar chord with her campaign pitch. “My entire life is a spectrum of the people of Jackson Heights, Corona and Elmhurst,” she said in a phone interview. But one thing that sets her far apart from Espinal is that Cruz herself is a “Dreamer,” a child of undocumented immigrants who came to New York at the age of nine and who only recently gained permanent resident status in 2009. “I went from being an undocumented child who picked cans in the street with her mom to survive, to being a Dreamer who was going to undergrad and paying for school for herself to a working poor lawyer...to being a middle-class New Yorker, which is basically the spectrum of the people who are here in our community,” she said. After graduating law school and working as a housing attorney, Cruz joined the Attorney General’s office, then headed by Andrew Cuomo, before he was elected governor. Cruz served afterwards in the Department of Labor as counsel in the division of immigrant affairs. She worked with former City Council Speaker Melissa Mark-Viverito -- who has endorsed her -- to write the legislation that kicked ICE agents off Rikers Island. She also returned to working for Cuomo, heading up his Exploited Workers Task Force, after which she joined Council Member Ferreras-Copeland’s staff. Her former boss has endorsed her, as have Council Members Dromm and Van Bramer, Helen Rosenthal, and Margaret Chin. “We’re a people-driven campaign,” Cruz said of her approach to the race. “We start with people and we end with people. We start with the idea that all of our policies should be informed by people.” Though her policy platform largely resembles Espinal’s, Cruz says she sets herself apart by virtue of her independence, experience, her focus on the residents of the district who cannot vote, and her pledge to refuse corporate and luxury developer money (the latter a promise like one made by Ocasio-Cortez, who attacked Crowley for the large corporate donations he received). “We are running a campaign that’s very much driven by people that live in the district and we’re independent from any ties to a political organization,” Cruz said. Democratic insiders pointed out that the Queens Democratic Party’s endorsement comes with political validation but not necessarily the resources to bolster a campaign, such as funding or boots on the ground. It’s why they disputed the characterization of the county party as a machine that can determine the course of campaigns. The party does, however, pressure potential contenders against considering a challenge to an incumbent and often brings with its endorsement a slew of loyal elected officials who coalesce around the county’s candidate and use their own resources and networks to boost them. The party also has connections at the Board of Elections and often attempts to knock challengers off the ballot and at times activates a network of district leaders and county committee members to help with ballot petition signature-gathering, door-knocking, and flyering. “It seems like [Cruz] has real momentum and...everyone’s going to attest the strength of her campaign to Alexandria Ocasio-Cortez but I think the reality of it is the dynamics of that race were shaped well before the congressional race,” said a Queens Democratic operative who asked to remain anonymous to discuss things freely. If the incumbent candidate backed by the Queens Democrats loses to an independent challenger, the optics are far from ideal coming so close on the heels of Crowley’s loss. But the county has invested little in the race, said another Democratic insider from Queens who knows both Espinal and Cruz and who decried the term “machine” as a “loaded expression” for a county party that simply tries to elect its own members to office. But the Queens county organization is undoubtedly powerful. The “machine” moniker stems from the fact that the party holds sway over more than just candidate endorsements -- its backing often also means a candidate will not receive a primary challenger. The county organization selects judicial nominees, and allies of Crowley have made hefty profits from being appointed as guardians in Surrogate’s Court. The party’s executive secretary is Michael Reich, whose partner Gerard Sweeney in the law firm Sweeney, Reich and Bolz, has been one of the biggest beneficiaries of Surrogate’s Court business. The county also selects one of the ten commissioners on the New York City Board of Elections, who decide which candidates qualify to appear on the ballot. The City Council speaker’s race has more often than not also been decided by the influence of the Queens and Bronx county parties; Council central staffers are frequently picked from the county’s ranks; and Council committee chairs are influenced by county allegiances. And though Crowley may no longer represent the House next year, City & State reported that he’s expected to be reelected county chair by district leaders for another two-year term in September. The county organization did not return a request for comment for this article about its support for Espinal. New Yorkers may soon have a new tool to influence their government. A bill in the state Legislature would allow members of the public, given enough support, to compel state agencies to hold public hearings on proposed rules. 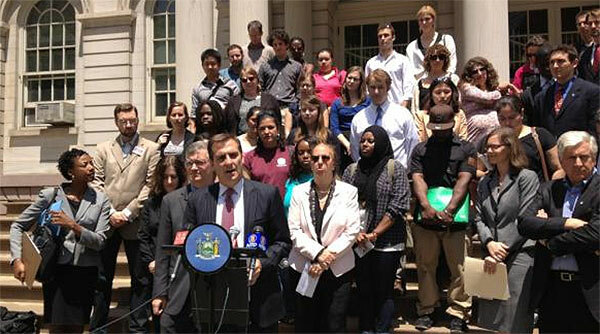 The bill (S2397), sponsored in the state Senate by Senator Michael Gianaris of Queens, would establish a three-year pilot program ordering seven regulatory agencies — the Workers' Compensation Board and the Departments of Education, Environmental Conservation, Health, Financial Services, Labor, and Family Assistance — to hold public hearings if at least 125 New Yorkers petition them to do so. Senator Gianaris told Gotham Gazette that these agencies were selected for being those that “the public would benefit the most from opening up.” The agencies listed craft rules that directly impact ordinary New Yorkers. The legislation, which passed the Senate unanimously on June 11 and now awaits action in the Assembly, where it has been stuck in committee since early February, also authorizes agencies to use “innovative means” of enhancing public participation in the rulemaking process, including establishing a designated time for public questioning of agency officials, organizing roundtable discussions, and using teleconference technology. Similar legislation passed both houses of the State Legislature in 2008, but then-Governor David Paterson, citing “technical flaws,” vetoed the bill. In response to this previous legislative failure, this bill included the Workers’ Compensation Board within its ambit and established a timeliness clause. If a petition is received later than the twentieth day before the last date for public comment, the public hearing becomes optional. The Senate bill and its companion in the state Assembly, A9737, appear to be identical. The Assembly bill, however, has not progressed beyond its February 5 introduction and referral to the Assembly’s Standing Committee on Governmental Operations. 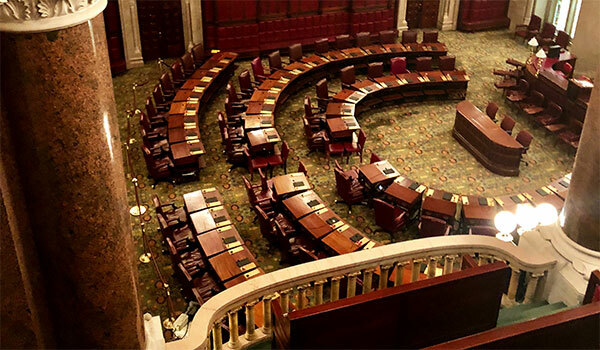 Until it is passed by committee, approved by the full Assembly, merged with S2397, and approved by Governor Cuomo, the aforementioned measures will have no bearing on the functionings of New York state agencies. It’s unclear if Cuomo supports the bill, which would place the burden of implementation upon executive branch agencies under his purview. Through a spokesperson, Assistant Assembly Speaker Felix W. Ortiz, of Brooklyn, said the bill should be considered next year. The legislative session is scheduled to end for the year on Wednesday. 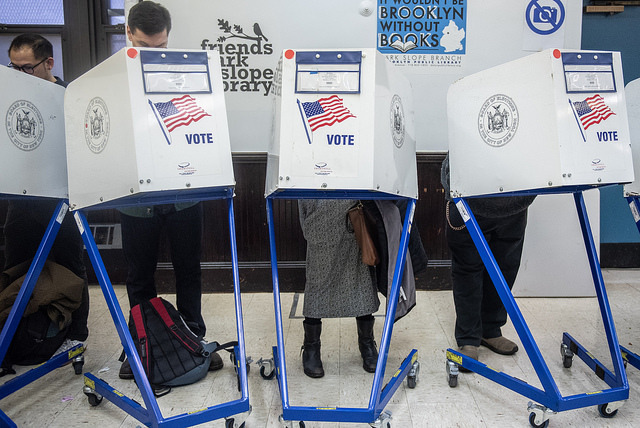 Is New York ready for an election cyber-attack? Are the state’s voting systems vulnerable to hacking? The New York State Assembly’s Election Law Committee heard testimony on Tuesday from state and local election board officials and cybersecurity experts on the systems in place to protect the state’s election processes from the types of coordinated cyberattacks that were carried out by Russian actors who sought to influence the 2016 presidential election. The hearing was prompted by developments in September, when the Department of Homeland Security informed officials from 21 states that their election systems, including their registration databases, were targets of the coordinated Russian hacking effort that also attacked the Democratic National Committee and members of Hillary Clinton’s campaign last year. 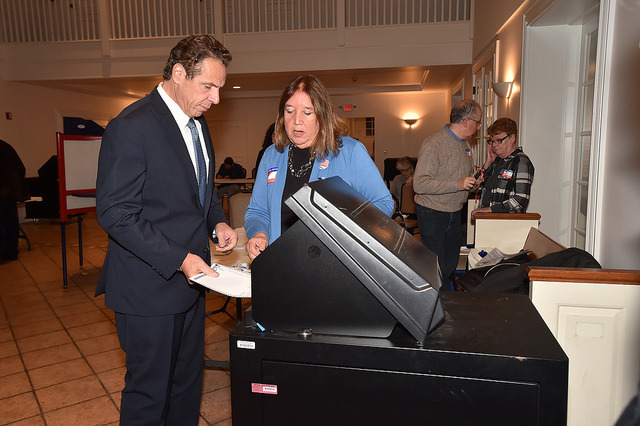 Although New York was not among them, the news raised concerns among state officials that similar incursions could be levelled against New York election infrastructure. With the local elections of this year over and a state-level election cycle coming up in 2018, when all of the state Legislature and the four statewide positions will be on the ballot, Assembly members spent four hours Tuesday seeking clarity on how election data is managed, results are counted and recounted, and how the state works with federal and local authorities to detect and prevent cyber attacks like the ones seen last year. “These attacks were not aberrations, they were not isolated incidents and only the most naive and or the most corrupt would believe that they will not continue into the future,” said Assembly Member Charles Lavine, a Democrat from Nassau County and chair of the committee, in his opening remarks. Officials from the New York State Board of Elections seemed to put fears at rest almost immediately, even as they acknowledged that certain changes are required and that existing regulations need to be implemented more stringently. The state has strict laws requiring certification and testing of both election software and hardware, Kellner said, as well as independent outside reviews of software. Wireless connections and networking capabilities are prohibited in voting equipment and even the computers used to program ballot scanners must be standalone devices without internet connectivity. “That isolation of the system used to set up the voting machines is something relatively unique to New York and it substantially reduces the possibility for the introduction of malware into our voting machines,” Kellner said. The state also prohibits county boards of elections from contracting with outside vendors to program voting machines, which Kellner did concede could be cumbersome for smaller county boards with limited staff. Finally, the state requires an audit of three percent of the voting machines used in each county after every election. The audit requirements were a particular focus of the hearing, with good government advocates and cybersecurity experts advocating for a new, more efficient method, called risk-limiting audits, developed in recent years. Risk-limiting audits randomly choose which ballots to audit for comparison with the paper record, and determine the statistical level at which one can be confident that election results are correct. It results in a changing standard for the number of ballots that have to be audited, depending on the closeness of election results. The closer the race, the more ballots would be examined, for instance. Kellner generally endorsed the idea and recommended that the committee explore legislation to enact the improved system. Kellner did have his own points to make during his testimony, noting that the law dealing with extremely close contests is “flawed” since escalating from a three percent audit to a full audit requires consensus from election commissioners representing opposing political parties, which is not easy to come by. Robert Brehm, co-executive director of the state BOE, said though the board is unaware if New York was directly targeted during the 2016 election, hackers consistently attempt intrusions into their systems and none have significantly affected election administration. The BOE takes a three-pronged approach to cyber-preparedness, he said, which involves developing a comprehensive risk assessment strategy, a strategy for county cyber-readiness, and bolstering plans to respond to individual incidents of cyber-intrusion. Brehm said state officials cooperate with a slew of federal authorities and are striving to ensure that the information shared between them is also given to county election boards, which lack a strong cybersecurity apparatus and are more vulnerable. The Assembly members present for the hearing at 250 Broadway in Manhattan, seven Democrats and two Republicans, had a broad range of inquiries. They asked about the board’s experiences with cyber attacks in the past, conclusions on trusted vendors who can work with county boards, and the mechanisms for keeping the legislative and executive branches of government in the loop. They asked about recommendations on electronic poll books (BOE’s Kellner said they had yet to thoroughly examine the proposal, though legislation to implement e-poll books has appeared close to passage in the Legislature), plans to update equipment, and cyber-readiness training for county BOE staff. Assembly Member Robert Carroll of Brooklyn raised the prospect of hackers attempting to purge voters from the rolls, asking the BOE officials how they monitor county BOE rolls. Brehm insisted the board conducts real-time monitoring of voter rolls and is working on updating its system. Carroll also mentioned the infamous purge of nearly 120,000 voters in Brooklyn ahead of the 2016 presidential primary, which Brehm said was due to a procedure being inaccurately followed rather than a failure in the system. He later emphasized the need for greater resources for county boards, and said the BOE would make a more substantial funding request in the upcoming state budget session. Michael Ryan, executive director of the New York City BOE, also insisted during his testimony that “money is always a critical thing,” although he did praise the cooperative attitude of the state BOE and federal officials. There were numerous recommendations made to the Assembly committee, some of which involved administrative solutions while yet others require legislative fixes. Dustin Czarny, commissioner from the Onondaga County BOE said the current voting and election system leaves little time to identify and remedy issues with ballots. He encouraged the Assembly members to pursue electoral reforms such as early voting and no-excuse absentee voting. The two are among a slate of election reforms that have stalled in the Republican-controlled state Senate, with minimal objection from Democratic Governor Andrew Cuomo or the Democratic-led Assembly. Susan Lerner, executive director of Common Cause New York, a good government group, and Susan Greenhalgh, vice president of programs at Verified Voting, a nonprofit focused on voting system technology, both argued for risk-limiting audits of voting machines. Lerner pointed out that the current election auditing method looks at the process rather than results -- by testing vote totals from machines instead of directly examining ballots. She insisted that the state must constantly inspect paper ballots for accuracy, must never allow online voting, and must do away with the current system of election audits. “A flat three percent audit really, we feel, doesn’t hit the mark,” she said, agreeing to help legislators and election administrators in crafting legislation on risk-limiting audits. Greenhalgh said the focus in computer security was increasingly on “resilience,” allowing a system to function even after it has been hacked. “If we’re looking at resilience in election systems, we want a system that would ensure that voters can vote,” she said, “that their votes get counted correctly...and that the proper outcome is realized.” She also supported the continued use of paper ballots as the simplest means of maintaining physical records, and reiterated the need for risk-limited audits. “There is a limit to what our security practices, as good as they are in New York, can do,” she said.